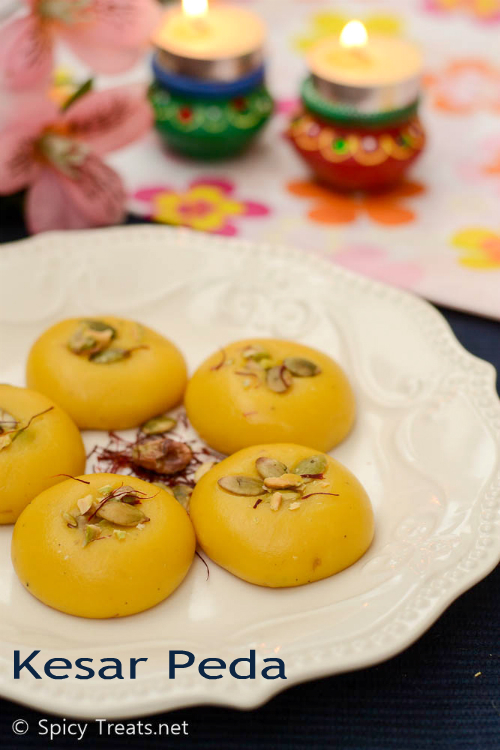 First warm milk in microwave for 30 seconds or to the warm milk add saffron strands and let it rest. Heat a non stick vessel or heavy bottomed kadai, add 3 tbsp water and sugar stir well. Cook till sugar get completely dissolved, no need to get any string consistency just bring it to rolling boil. Then add milk or mawa powder, milk, butter, food color and stir well. Now the mixture will be thin and liquidy, keep stirring in medium heat until the mixture turns thick and starts leaving the sides of the pan. To check the right consistency, grease ur hand and pinch a small portion and roll it, it should roll without sticky. Once it is done add cardamom powder mix well and switch off the stove. Allow the mixture to cool down, when it is slightly warm grease your hand pinch a lime sized portion, then make small balls and flatten gently and garnish with nuts. 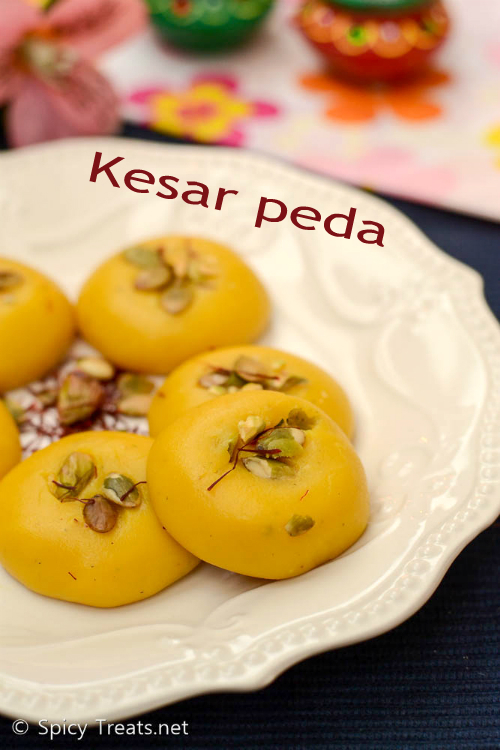 That's it...delicious Kesar Pead ready to serve. *Sugar quantity can be adjusted and you can also use up to 3/4 cup, I have tried with used 3/4 cup sugar and 2 tbsp water. 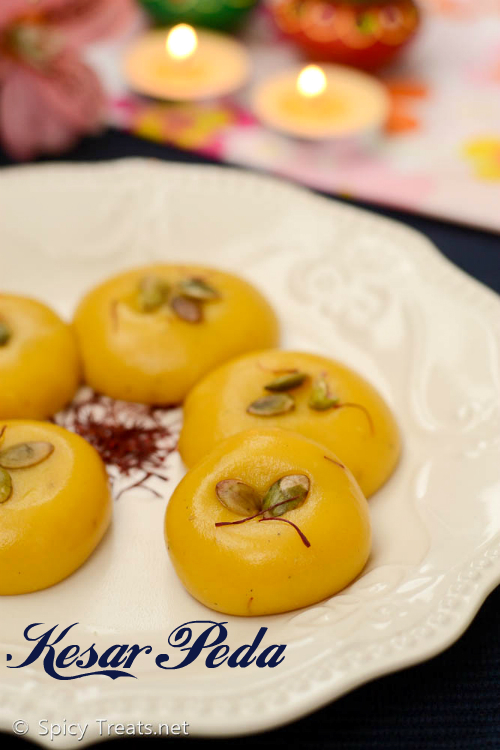 You can also use tutti frutti to garnish the peda. 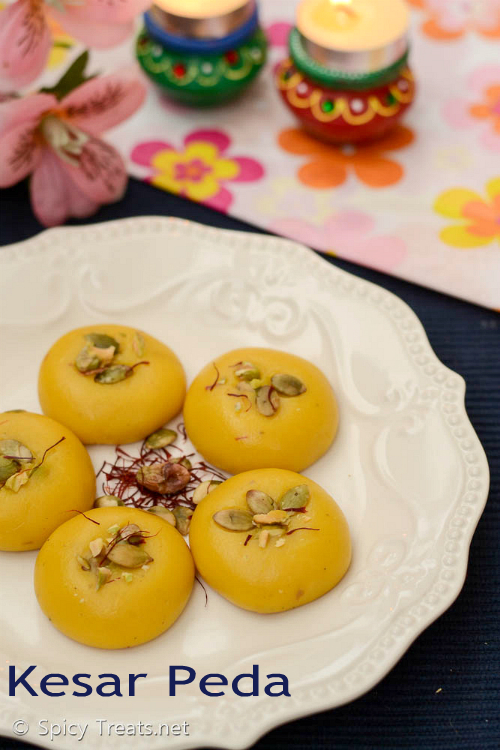 Initially the peda dough will be loose but after cooling it gets thick, just knead it few minutes and shape into pedas. chewy n delicious fudge,love the color of pedas..yummmy ones!! Yummy Peda for Diwali celebration. Happy Diwali Wishes to you and family Sangee !